There are two major versions of the Python programming language: the Python 2.x series, and the newer Python 3.x series. 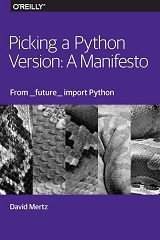 The Python 3.x series started with the release of Python 3.0 in December 2008; since that time, Python 2.7 was released and has continued to receive point version releases, with Python 2.7.9 being the latest version as of this writing. As a footnote, there was, naturally, a Python 1.x series that was highly successful in the 1990s, but that series has long been out-of-maintenance. In his 2014 PyCon keynote (Figure 1-1), Guido van Rossum, Python's Benevolent Dictator for Life (sometimes affectionately called the BDFL or GvR) made it clear that the Python 2.x series will not continue past Python 2.7.x. The end-of-life for Python 2.7.x is 2020, and no new features will be added to the 2.x series of Python. Senior Software Engineer and Senior Trainer at Continuum Analytics, Inc., David is a well-known author and speaker in the Python community, he wrote the long-running columns, Charming Python and XML Matters for IBM developerWorks and the Addison-Wesley book Text Processing in Python, and has spoken at OSCon, PyCon, and keynoted at PyCon India.